After Game 1, I loved me some Carrie Underwood. In fairness to– in fairness to me being honest?– I was fond of Carrie well before Game 1, but her hockey Twitter reactions made me even more of a fan. How did Mrs. Fisher-Underwood/Underwood-Fisher do with the way that Game 2 unfolded? No idea what she was referring to here, but I assume it was Cullen being boarded. ...again, vague, so I'll assume she meant the phantom slash/hooking on Malkin. Carrie Underwood is officially more qualified to be President of the United States of America than Donald Trump. 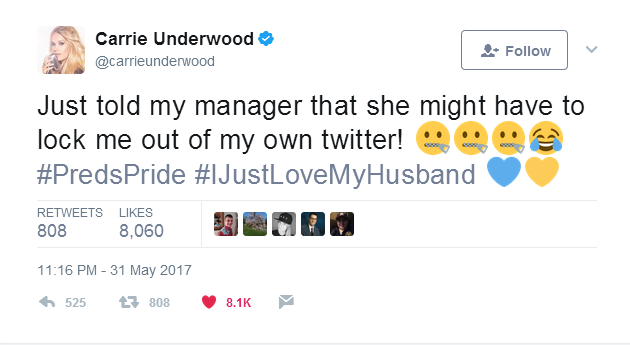 Okay, so Carrie Underwood batted a respectful 1-for-3 during her Game 2 Tweets, which makes her relative Tweet save percentage .333. 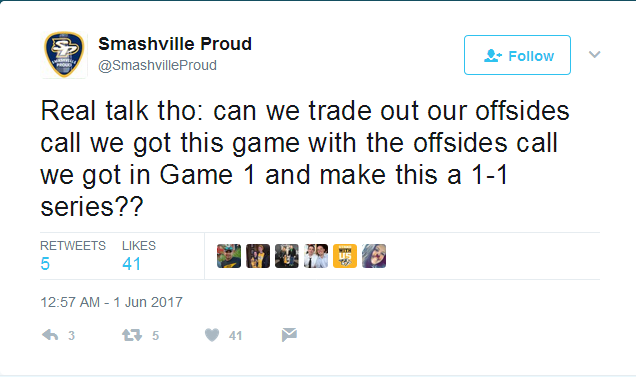 ....how did Pekka Rinne do following his historically awful Game 1 showing? Rinne stopped 19 of 23 shots, which meant that he surrendered 4 goals (...again) and could only muster a save percentage of .840. ...then an .840 save percentage just doesn't cut it. Pekka Rinne was benched after surrendering his 3rd goal in about 3 minutes to open the 3rd period (the Penguins' 4th overall), and his backup, Juuse Saros, mopped up the rest of the contest as the Pittsburgh Penguins rolled to an impressive 4-1 win and a 2-0 lead in the 2017 Stanley Cup Finals. Jake Guentzel tied the contest at 1-1 by scoring a "bad angle goal" (see: AWFUL) against Rinne in which the only conceivable way the puck could have gone into the net was precisely how it went into the net, and was but a precursor to the eventual game-winner Guentzel would score just 10 seconds into the 3rd period. Scott Wilson would score moments after Guentzel's second of the game, and Malkin would close out the scoring just minutes later on a 2-on-1 in which he wired a perfect shot past Rinne to both knock the Predators' netminder out of the game and to give the Penguins an insurmountable 4-1 lead. The officials WERE terrible, but not the way that Carrie saw the game. There were 11 power-plays in the game (which resulted in zero goals), but there could have been a number of other calls that went against the Predators, namely a board by Matt Irwin on Matt Cullen and PK Subban punching Sidney Crosby in the face when Crosby was down on the ice. In both cases, there was a referee staring at the play, and in both cases, no calls were made, but CLEARLY, the Penguins get all of the calls...oh, what's that? Yes, the dreaded "Call Back a Goal Because of an Offsides" struck again, but this time it wiped out a Patric Hornqvist goal while throwing a katana-sized dagger into the "WAAAAHH THEY CALLED A GOAL BACK AGAINST US" narrative that Nashville desperately wanted to play up after Game 1. If you're Nashville, there's nothing you can hang your proverbial hat on: you outplayed the Penguins and lost 5-3. You got outplayed and lost 4-1. Your goalie has sucked, historically sucked. PK Subban hugged (in theory, fought) Evgeni Malkin. 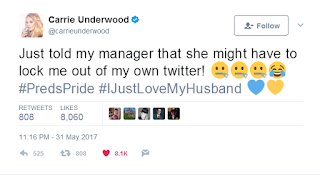 Carrie Underwood has by now left Pittsburgh, leaving a gaping hole in our female celebrity quotient (I tried to figure out which female celebrities were left in Pittsburgh but I failed...help? ), but no matter, the Pittsburgh Penguins lead the Nashville Predators 2-0 and need only 2 more wins to claim their 5th Stanley Cup Championship. ....and because it means that Carrie, lovely Carrie, will spend one more day within our fine city.